Suse 8.0 RPMs have been uploaded in the downloads section thanks to the work of Antonio E. Suse 8.1 RPMs by Stefan Bruens are coming soon! Thanks to Mike K. Bennet, KMess will now work with GnomeMeeting. 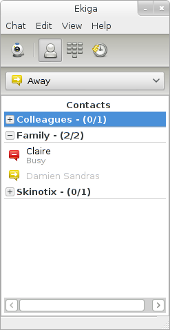 KMess is a KDE MSN Messenger client that can be found on http://kmess.sourceforge.net. KMess now supports compatibility with invitations to use MS's NetMeeting. This works both ways, allowing NetMeeting to GnomeMeeting invitations, GnomeMeeting to NetMeeting invitations when you are using KMess and your contact is using MSN Messenger. It also supports GnomeMeeting to GnomeMeeting invitations when both you and your contacts are using KMess. GnomeMeeting 0.96.1 has been released! GnomeMeeting 0.96.1 is available for download today at the usual location. This is a minor bugfix release but it also contains a few improvements. The ILS server ils.seconix.com has been down several times in the last few days. The problem is that it has been very successful (130 users connected each night). We are trying to find a replacement to the current OpenLDAP + NDK implementation, but don't hesitate to mail me personally when you notice the server is down. Thanks! FOSDEM was a great event. I have uploaded the slides of my tutorial here. There are fewer slides than usual because it was a demo tutorial. The config files I used for the gatekeeper are available on request. Jonita has uploaded pictures we have taken during the week-end. That is a good opportunity to see how GnomeMeeting contributors, developers and translators look like. SAN FRANCISCO, California - February 5, 2003 - Quicknet Technologies, the leading provider of end-to-end voice, fax and video IP telephony solutions and technologies for Linux today announced the first Linux commercial PC-to-Phone supported service for Linux users in concert with GnomeMeeting.org. Today is a great day, GnomeMeeting permits you to finally place PC-To-Phone calls under Linux (and FreeBSD)! Announced PC-To-Phone calls are now possible thanks to the work of Quicknet and MicroTelco. You can register an account and buy hardware on http://www.linuxjack.com. You can also consult the rates on http://www.microtelco.com. Please look at the FAQ for more detailed information. GnomeMeeting 0.96 aka "Seems, madam? I know not seems!" released! We are delighted to announce the latest release, version 0.96, with additional IP Telephony capabilities. Now, GnomeMeeting users can place low cost PC-to-Phone calls anywhere in the world using Quicknet's MicroTelco Internet Telephone Service (see the FAQ for more detailed information). GnomeMeeting v0.96 is a full release with added new features and updates to the prior release. The FAQ was just updated with a new layout, it should now be more easily readable. The FAQ content should be updated by Damien when GnomeMeeting 0.96 will be released next week. I'm also working on a blue skin for the website, as requested by some visitors. Just a quick note to announce that GnomeMeeting 0.96 should be released in the following weeks. It will be a major release with many new features and some bugfixes. That release should be very stable and bring the level of functionality that people could expect of a 1.00 release. I'll be giving a GnomeMeeting tutorial at FOSDEM on 8th and 9th February in Brussels. I will show the use of GnomeMeeting with MCU's, Quicknet cards, gatekeepers, PC-To-Phone gateways.